Peter Eugene Ball has made a number of sculptures of Christ on the cross or as the risen Christ for cathedrals and churches in the past, and his latest work for the Church of the Holy Spirit at Southsea is the culmination of various ideas, techniques and devices which he used and developed over the years. Some of his crucifixes convey the suffering of Christ on the cross, as in his Crucifix at Birmingham Cathedral, others depict a gentler but profound sorrow and resignation as in Winchester Cathedral. By contrast, a Christus may be a strong and hopeful image as the Christus at St Bede’s Church, Basingstoke. For the Southsea piece Peter envisaged Christ in a state of transcendency – the Risen Christ on His journey to join His father, resigned to His fate and full of hope for the future. Hence there is no cross, no nails in His hands and feet but only the stigmata. With arms outstretched He offers himself freely, eyes closed in contemplation of the future. Sometimes Peter’s figures are naked apart from a simple loin cloth, creating a stark and dramatic sculpture. Others are clothed in flowing, patterned robes which soften the image and give it a warmth and dignity. For this piece he has chosen a clothed figure whose vestments he adorns with gold leaf and decorates with simple patterns of swirls and spirals. These circular marks symbolise celestial movement: comets and stars, and also echo the sentiments of the medieval period when spirals and mazes represented a journey and related to the circle of life. They also signified Christ as the centre of the universe. At another level, in prehistoric times circles and spirals were thought to be related to dance. For example, prehistoric people had keenly observed nature and noted the peculiar circular dancing movements of cranes on the lake shores. They interpreted these circular motions and incorporated them into their philosophical beliefs – again representing the circle of life and man’s journey. 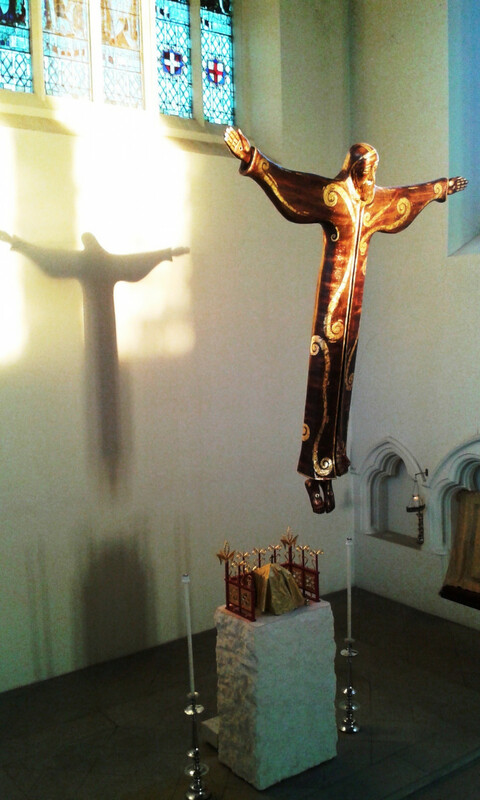 The Southsea Christus is made from wood with beaten copper and embellished in gold leaf. It is approximately 10 feet tall and, along with the Southwell Minster Christus, is the largest Peter has made. He has tried above all to create a devotional image to which people can relate and which offers a sympathetic focus for thought and prayer. As well as being an exceptional work of art, it must also possess transcendental qualities which lift it beyond mere contemporary art to provide a sacred and timeless icon which harmonises with its architectural surroundings and becomes a precious asset to the Church of the Holy Spirit at Southsea.